It’s finally here, comic fans! A fan-favorite finally has her own solo comic! She’s a merciless assassin, she loves pink, and she’s not from the 616-verse! Introducing the one, the only, GWENPOOL! Wait, you’ve never heard of Gwenpool? She’s the next big thing! She’s awesome! Okay, okay, let me explain. Gwenpool came about after a series of variant covers depicting Gwen Stacy as classic Marvel characters, including Iron Gwen, Gwen-Groot (Gwoot? ), and Gwenverine. A drawing based on Deadpool became immensely popular, inspiring cosplays, fanart, and a general amount of squealing and excited hand-wringing on the social medias. Naturally, Marvel decided to make the character a reality in a three-part backup story in the pre-Secret Wars Howard The Duck series. Wait, you don’t know who Howard the Duck is? Long story short, duck from a world of ducks, came to our Earth through a cosmic accident, trapped for good. If you want weirdness and satire, his series is a perfect match, making it the obvious choice for Gwenpool’s introduction. The story proved to be popular, prompting a one-shot holiday special (appropriately titled Gwenpool Holiday Special #1) which features three interlocking stories all starring different characters, but with a focus on Gwenpool. Later that month, an ongoing series was announced, so here we are. The funny thing is, Gwenpool might not actually be Gwen Stacy, strictly speaking. She has blonde hair and her name is Gwen, but she has a different last name. Part of the backup origin story had her coming to a costume shop, asking for a costume. The clerk decided on giving her a look modeled after Deadpool, seeing as her last name is Poole. Maybe ‘Poole’ is her family’s maiden name or surname. Honestly, I don’t really care. Just as long as the series is enjoyable, I’m satisfied. It’s time to embrace the madness, let’s jump into The Unbelievable Gwenpool #1! 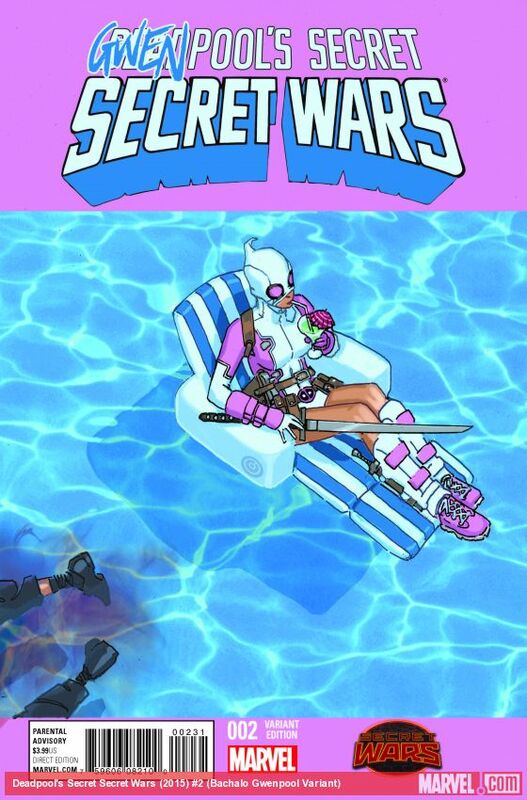 As it turns out, Gwenpool is actually a lot like the classic version of Deadpool. The prologue features her violently stopping a gang of bank robbers and recruiting her own version of Weasel (Deadpool’s former tech guy; her techie frenemy is a teenager named Cecil, but he fulfills the same role). She loves killing bad guys for money and doesn’t have too many scruples. For anyone who isn’t the biggest fan of Deadpool being an Avenger, I suggest you give it a try, although his series is still very engaging. She’s still getting costume repairs from Big Ronnie’s Custom Battle Spandex, a store that specializes in superhero costumes. I guess Leo retired. I wish him well. Her narration implies that she has come from a world very similar to ours, where all of the Marvel characters are just, well, fictional. This allows her to have the same fourth-wall breaking antics as Deadpool, just in a different tone. The art is delightful. Gurihiru, the production team, does a fantastic job of making the situations look breezy and colorful, even with a lot of destruction going on. Gwen herself looks like a manga character, which is a nice touch. The story is hilarious: Gwenpool just uses her knowledge of the Marvel universe to stop villains, which is all well and good, but not the most useful when she keeps getting beaten up by hired goons and robots. The supporting characters add to the humor. I really hope that we see more of Big Ronnie in the future. Despite the bright colors (and generally sunny protagonist) the story has a dark twist near the end that I don’t want to ruin. Suffice it to say that Gwen might not be the hero she thinks she is. The Unbelievable Gwenpool #1 is well worth your time, with an interesting protagonist and a neat story. There’s even a few cameos from some regular Marvel characters. Definitely check it out.